If you have questions, we’re here to help. 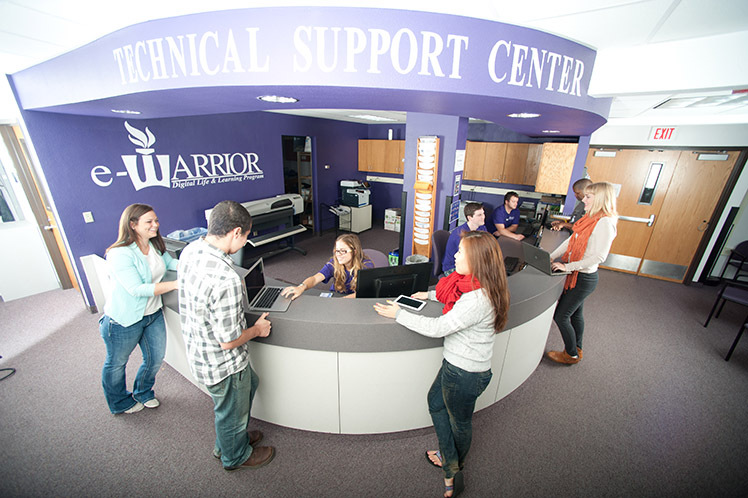 The Technical Support Center (TSC) assists, educates and serves students, faculty and staff with hardware and software. Full-time staff and trained student workers are available in person, by phone and online to troubleshoot computer and tablet problems. Tech Support serves all students – undergrads, part-time and graduate – on all campuses. Tech Support will help students who aren’t enrolled in the eWarrior program access email, connect to wi-fi, learn to use campus-supported software, and print from their personally-owned devices. We strongly recommend you make your WSU and StarID passwords identical before the conversion to help make the transition easier. Visit StarID FAQs to learn more about how to reset your password and access WSU services. During business hours Somsen 207 is where students, faculty and staff can get assistance with hardware and software issues. Generally the wait time is 5 minutes or less with total resolution of the issue within 45 minutes. Please anticipate longer wait times the first two weeks of the semester. During business hours Goddard Library 118 is where students, faculty and staff can get assistance with hardware and software issues. Call 507.457.5240 to speak with a phone technician. Your call should be answered or escalated within 10 minutes during business hours. If your issue requires an on-site visit from a technician, expect to be contacted within 1 business day to schedule the appointment. Send your questions to AskTech@winona.edu and expect a response within 1 business day. Emails received after hours will be replied to the following business day. Responses to frequently asked questions are available at AskTech, an online tool where you can search for answers to common questions or ask a question of your own. Available 24/7, the WSU Technology Knowledge Base is a great resource with information customized specifically for WSU students, faculty and staff. In addition, LyndaCampus gives WSU students access to a library of over 2000 online courses that cover a wide variety of software tools and skills. Use the Password Reset Tool to reset your StarID password at any time yourself. If you need assistance, contact the Technical Support Center. The security of personal identities and records is of primary importance at WSU. Once admitted, the StarID and password becomes their digital campus identity. If you forget your password, you may be asked to authenticate who you are. Each student is allocated 1,000 black and white laser pages at the beginning of each semester. Additional print allotments can be purchased in increments of $5.00 for an additional 125 pages. Use your StarID and password to check your page balance and view your print summary. Read more about the student printing policy. Printer Locations: Students can use approximately 90 laser printers on the Winona campus for their black and white printing needs, including at least one in every classroom building and residence hall, high speed duplex (two-sided) printers in the Krueger Library, and several in Kryzsko Commons. Color and Custom Printing: For your convenience, color printing, large-scale (poster) printing, laminating, trimming and other print related services are available on the Winona campus. Visit the campus printing page to read more about these services. Printer Locations: Students have access to black and white printers in the Library Technology Center, Goddard Library and the computer labs. Color and Custom Printing: RCTC Media Services, located at the RCTC Technology Support Center (GL100) is your convenient Rochester campus resource for color printing, poster printing or any other custom printing. You are responsible for ensuring you have a backup copy of your files, but we’re here to help. Please follow these instructions for backing up your Mac files or backing up your PC files. If you need assistance with the process please call or stop by the Tech Support Center in Winona or Rochester. The WSU Tech Support Center is not liable for losses of data or services resulting from failures typical of technology, one’s own unintentional actions, theft, intentional damage, or accidental damage including acts of nature. Using your cloud storage and frequently backing up your computer is the best way to ensure you don’t lose data you need. The Tech Support Center does not own advanced data recovery software and our staff is not trained in advanced data recovery. If you lost data, we will attempt to recover it using a few simple tools. If we can’t retrieve the data, we will refer you to a reputable data recovery service. Again, frequently backing up your computer is the best way to ensure you don’t lose data, have to pay for an expensive data recovery service, or spend hours recreating a paper or project. The Tech Support Center has laptops available to rent for a maximum of one week. Fees will be charged as noted below. The fee will be added to a student’s account upon return of the laptop. Faculty and staff need to sign a chargeback form authorizing the rental fee to be charged to their department. All rates are based on the client picking up and returning the laptop to the Technical Support Center during business hours. If it is returned late, fees will continue to be assessed until the laptop is returned. Requests for adding special software, delivery and set up of laptops, and assistance outside of the Tech Support Center will be charged at a rate of $45/hour and may require advance planning. If the rental laptop is returned damaged, fees will be assessed as noted in the eWarrior agreement. The Technical Support Center provides limited assistance for the personally-owned devices of students who are currently enrolled and registered for classes, but not enrolled in the eWarrior Digital Life and Learning Program. For hardware repairs, software installations, and other technical issues, you will need to work with the vendor who sold you the device or a third-party service. For the protection of the campus community, personally-owned laptops connecting to the WSU campus network must have a current antivirus program and cannot have an outdated operating system. The Technical Support Center will not provide support for personally-owned laptops without an active antivirus subscription. Viruses, worms, Trojans and other malware are now an everyday occurrence in the connected world. They can spread quickly across campus networks, causing considerable damage and can also result in a breach of private data. The Technical Support Center cannot provide support to personally-owned laptops with an outdated operating systems, one that is no longer supported by its manufacturer and therefore does not receive updates to protect it from security risks. Use the following guides to connect personally-owned devices to the WSU wireless network. Contact the Tech Support Center if you need additional assistance. Students and employees can set up and configure their personal smartphones and other handheld devices for email and to connect to the WSU network by using instructions provided on our Technology Knowledgebase wiki or their mobile device vendor. The device must have up-to-date antivirus protection and a current operating system to be connected to the WSU network. The Tech Support Center will help if time is available. With hundreds of different smartphones and handheld devices sold from numerous vendors, we do not guarantee that our staff will be able to successfully configure your device. The Tech Support Center cannot be held responsible for damages or loss of data. If you handheld device is personally owned, there may be a Tech Support charge of $1.00 per minute after the first 15 minutes of setup service. WSU’s Winona and Rochester campuses have an extensive wireless network available to students, employees and guests. WSU devices will automatically connect to the network when they are turned on.